As first-year students descend on Laurier's Waterloo and Brantford campuses to begin a new school year, a lesson in giving back will be among the first orders of business. As part of orientation week activities, students will take part in Shinerama, Canada’s largest annual post-secondary fundraiser in support of Cystic Fibrosis Canada. The event, which has become an orientation week tradition on university and college campuses across the nation, was born at Laurier in 1961, when student Paul Enns conceived a shoe-shine fundraiser to benefit local charitable causes. "We're so proud that it originated at Laurier – that's definitely a source of pride," said Jill Utter, 2016 Shinerama coordinator with the Wilfrid Laurier University Students' Union. "We are so lucky that we have this volunteer atmosphere at Laurier. The students who are involved want to be involved and they're excited to be involved." Shinerama will see Laurier students fan out to more than 60 sites in Waterloo, Kitchener, Cambridge and Brantford on Saturday, Sept. 10, hosting barbecues, car washes, collecting loose change and helping people carry groceries to their cars as ways to raise funds for the cause. The effort will have a big impact, Utter said, with Laurier organizers aiming to raise between $50,000 and $100,000 for the fight against cystic fibrosis. Cystic fibrosis is the most common fatal genetic disease affecting Canadian children and young adults. There is currently no cure for the disease, which impacts the digestive system and lungs. Shinerama became a national fundraiser for cystic fibrosis research in 1964 and has raised about $26 million since then. "Shinerama makes such a huge impact in the lives of people living with cystic fibrosis," Utter said. "It's just such a wonderful day. You're so full of joy and gratitude that you have all of these volunteers around you who are so thoughtful and caring and working toward the same cause." Shinerama is the perfect introduction to Laurier's outstanding culture of volunteerism and giving back to community, said retired Laurier business professor Mark Baetz, an advocate for students making volunteer experiences an essential part of their post-secondary education. "We started something that has become a flagship of how to start a university career – with some kind of community service," Baetz said. "It isn't just about helping people with cystic fibrosis; it's also that you're starting to clarify your own values through service experiences right from the get go. "When you have a huge endeavour like this, it has huge potential for learning." As an institution, Laurier encourages volunteerism as a way for students to live lives of leadership and purpose while attending university and beyond. The university's Co-Curricular Record initiative, online Volunteer Portal, Community Outreach Council and volunteer engagement events keep volunteerism front and centre, while its Community Service-Learning program is designed to help students understand the importance of volunteerism and to remain active volunteers throughout their lives. At Laurier, Community Service-Learning is a program that integrates community engagement with classroom instruction and critical reflection. As part of Community Service-Learning, students spend time working with one of Laurier's non-profit community partners. Students learn theories or concepts in class, see them in action at partner sites and then have the opportunity to reflect on the experience. More than 1,380 Laurier students participated in a Community Service-Learning class during the past academic year, working with a total of 246 community partners in Waterloo and Brantford. "We want students to see it as a life-long journey," said Gail Roth, manager of Community Service-Learning at Laurier. "What we're really trying to do is be very intentional about it, trying to reflect back what they're learning in class. Hopefully it does springboard into volunteering and seeing that volunteering is an important part of being part of a community." Laurier’s focus on service-learning is rooted in its Psychology department, which has offered undergraduate community field placements for more than 40 years. A $1-million grant from the J.W. McConnell Family Foundation in 2006 helped create the Laurier Centre for Community Service-Learning and expand field placements to other departments at the university, including the Faculty of Arts and Lazaridis School of Business and Economics. The goal is to teach students social responsibility, as well as foster intellectual growth, leadership development, appreciation for diversity and collaboration skills. Community Service-Learning also promotes self-awareness, helping students clarify their educational goals and personal values. Baetz says that a fundamental objective of Community Service-Learning is to encourage a “reciprocity” by which there is gratitude and learning both ways between the student and the community partner. Those assisted by the volunteer activity are grateful and inspired by the help they receive from students; in turn, the students are inspired by how much assistance they are able to provide and how much they can learn from their community service. In addition to Community Service-Learning, Laurier offers students the opportunity to develop and maintain a Co-Curricular Record, an institutionally recognized document that chronicles volunteer and student leadership activities that are not for academic credit. The university's online Volunteer Portal provides a place to seek out local volunteer opportunities. Students can also book an appointment with a career consultant at Laurier's Career Development Centre to help decide what type of volunteer opportunity is right for them. As well as Shinerama, new students can get involved with Laurier's Community Outreach Council, a group of first-year Golden Hawks who share a passion for giving back. And on Tuesday, Sept. 27, the Waterloo campus' annual Volunteer Fair will showcase volunteer opportunities in the concourse from noon until 3 p.m. A partnership between the Career Development Centre, Community Service-Learning and Centre for Student Life and Engagement, the Volunteer Fair will include more than 25 local organizations seeking volunteers. Organizations in attendance will include Big Brothers Big Sisters, the Sexual Assault Support Centre of Waterloo, Special Olympics Ontario, Lutherwood, Kids Ability and THEMUSEUM. "There will be a wide range of opportunities and a lot of them will be working with people, making a difference in the community," said Katherine St. Louis, manager of Career Resources and Operations with Laurier's Career Development Centre. "It's also a way for students to learn about potential careers and to gain experience and skills that will help them whether they're applying for graduate programs or looking for jobs. "It exposes students to things they don't even know exist as possibilities." Laurier's Brantford campus will host a Community Engagement Fair on Sept. 29 from 2 p.m. until 4 p.m. in the Research and Academic Centre West. Laurier's focus on volunteerism is clearly yielding results. A study by business and professional networking website LinkedIn conducted last year found that Laurier has the highest proportion of students and alumni with volunteer experience when compared to universities around the world. The site analyzed 10 million professionals who added volunteer causes to their LinkedIn profiles. When they looked at where those professionals attended university, Laurier ranked No. 1. It's a tradition sure to be continued by first-year students who will get their first experience as part of Laurier's culture of volunteerism during this year's Shinerama fundraiser. 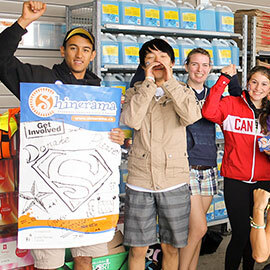 "For me, the peer-to-peer volunteer experience at Shinerama is vital," Baetz said. "When you have role models and leaders like Laurier, we become role models and leaders to encourage others to say 'this is good for everybody. It's a win-win.'"